The AVR Dragon is nice because you can use it as a small developpement device without any other requirement: Simply drop the needed ATMega on the board, some little wrapping for : Jtag + power supply. As you can see, this is compact and nothing else is needed. The power supply come from the USB port, and I soldered a DIP on the board.. and that’s it. I use the Jtag connector, so now I can use a real debugger instead of playing with the UART. Simply put a breakpoint, and enjoy :) By this way, I figure out that most of the time I simply push some stuff in arrays, and inspect them with debugger. This is really efficient. For example, last week I need to fix a timing issue with a IR sensor, simply wrap the little board, and push all interrupts in a array with the related timing. 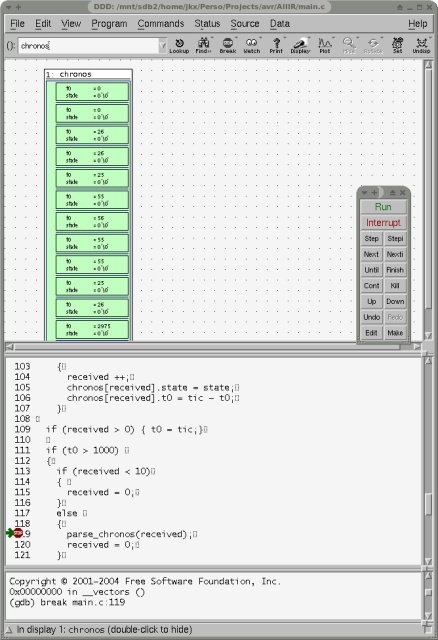 Of course, this can be done with a serial connection too, but it will take more time, and even worst if you encounter a bug, you will have to find where is it (the UART printf, or the code itself) .. So, how to use this with a Linux OS ? ddd --debugger "avr-gdb -x gdb.conf"
I hope this little tuto will help people looking for a nice AVR debuger for the AVR on Linux (or any OSS system). 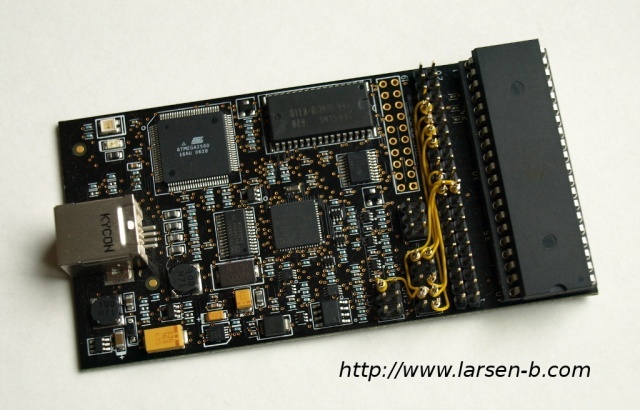 The AVR Dragon is definitively a must have for low budget user in AVR scene. This entry was posted in Electronics and tagged avr, gdb, linux by admin. Bookmark the permalink. Somebody tell me that, we can do the same with Eclipse. If somebody know how, please post here .. I like the window style on these pictures. What WM and theme are You using? OT: The WM is the xfce one, aka xfwm4, with Gaudy theme. I have been trying out gdb with avarice but I got some errors when debugging. The fact is that I get no errors if I don’t use any functions in my code but it just doesn’t read the proper values if I do use them. Anyone has had any problems about the same issue? by the way, how did you compile your code? Am I missing any flags? If somebody would be interested in debugging with use of gdb under VisualStudio, then please check our site http://www.wingdb.com. an important detail: you need to program the debugWire fuse to enable dW before using avarice (e.g. with avrdude). avarice can’t enable it itself. if you try with an unprogrammed DWEN fuse you will get the error message “set paramater command failed” (with verbode/debug output ‘-d’ you will also see “response: AC”). “gdbconfiles:No such file or directory” I have launched ddd in the directory where the code is present. Am I doing any mistake here?